The following widget area settings are provided as a reference. It is recommended to install the widget demo content that is included with the theme. The Before Footer widget area contains one Image widget and two Custom HTML widgets. The image widget is used as the background image for this widget area.. This widget area contains one Custom HTML widget and one Simple Social Icons widget. The Custom HTML widget is used to add a paragraph before the social icons. 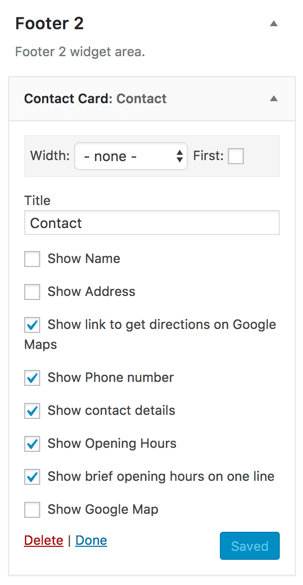 The Footer 2 widget area uses the Contact Card widget that is created by the Business Profile plugin. You can control the output and change your business details from the admin by navigating to Business Profile one the left sidebar menu. 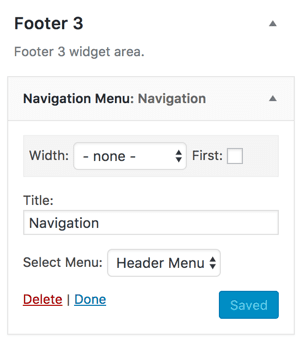 The Footer 3 widget area contains a simple Custom Menu widget. The theme demo uses the Header Menu for this widget but you can change it to anything you like by creating a new menu in the admin from Appearance > Menus.